Over 17,000 islands come together to create the archipelago that is Indonesia, and three months into my placement I had still only been to one of those islands, Java. There are certainly plenty of advantages to being placed on what my sitemate perceptively calls the “favorite child” (Java has significantly superior infrastructure to the other islands, creating an extremely interesting kind of privilege which I hope to further explore during my time here), but one of my goals for my nine months in Indonesia is to try to get a more complete picture of Indonesia as a country, in what capacity I can in such a short time. 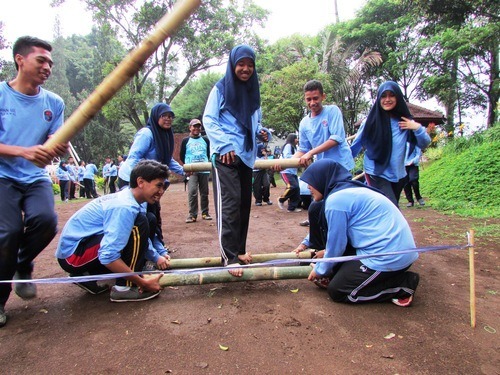 I am able to accomplish some of this by talking to my students from my second campus, who come from all across Indonesia, but I still wanted to see some of Indonesia’s great diversity with my own eyes. My first opportunity came fairly recently, during my school’s final period. (Due to restrictions from the Indonesian government which have been put in place to discourage cheating, I am not allowed to be in the classroom during the final examinations. As a teacher, this drives me a bit insane, but there is little I can do about the situation.) Encouraged by my co-teachers to travel during this time—“Go! 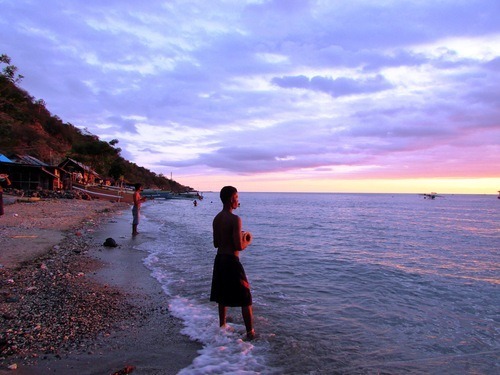 See Indonesia!”—I packed my backpack and boarded a plane to Gorontalo, a city in the northern part of the island of Sulawesi, where a fellow ETA—whom I have come to adore—is placed. I knew very little about the city, or even the island itself, but I had someone there who could show me around, and it was somewhere new; and so, somewhat impulsively, I confess, I went, not knowing that North Sulawesi would soon become one of my favorite places in Indonesia. Upon stepping off the plane and getting into the travel car my friend had pre-arranged for me, I found myself unable to decide whether Gorontalo was exactly like Malang, or completely different. 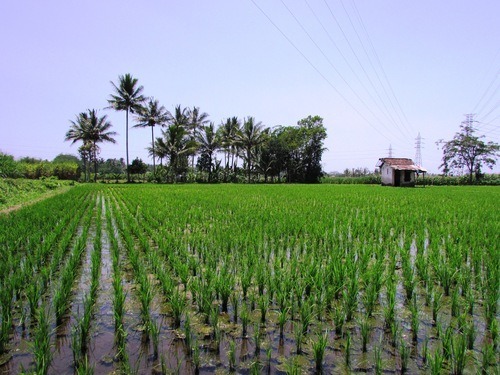 I was surrounded by rice fields, a familiar site for me because I live a bit outside of the actual city of Malang, but there was a noticeable lack of sugarcane, which seems to be the primary crop in the area in which I live. I had been told the rest of Indonesia would cook me alive next to the relative coolness of Malang, but I found Gorontalo to be much cooler than I anticipated it being, though the breeze I felt had the distinct taste of the ocean, rather than the cool mountain freshness I have in Malang. 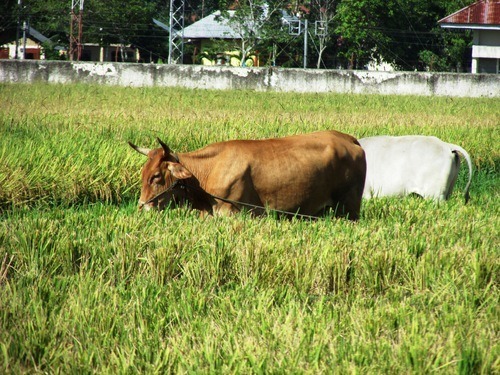 Perhaps the biggest difference that I first noticed was the abundance of sapi-sapi (cows) in Gorontalo. Though I live near the city of Batu, one of the only places in Indonesia with temperatures cool enough which can support a dairy industry, and am surrounded by fields and farms, the only time I have really seen cows since coming to Indonesia was during the period before Idul Adha. In Gorontalo, you cannot throw a rock without hitting a cow, and I immediately began babbling like an excited two-year-old (and probably with a more limited vocabulary than most Indonesian two-year-olds) to this man I had just met about how excited I was to see cows: “Ada banyak sapi di Gorontalo! Tidak ada sapi decak aku di Malang! Keluargaku punya sapi di Amerika!” (“There are many cows in Gorontalo! There are not cows near me in Malang! My family has cows in America!”) He immediately began trying to persuade me to take a cow home with me, and to point out every cow we passed; I knew from that moment that I was going to like Gorontalo. As soon as I had dropped off my bags at my friends’ house, we hopped on her motorbike to explore more of the rural aspects of Gorontalo. 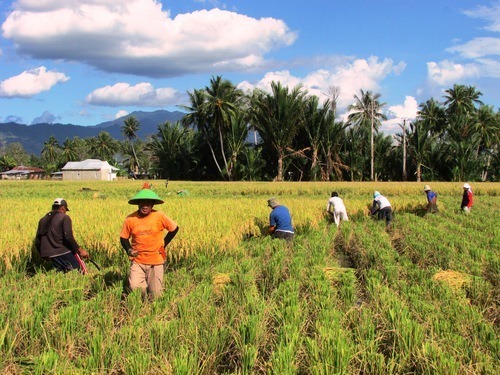 During her time there, she had befriended a family who had invited her to see their rice harvest, and it happened to be in full swing on the day I arrived. 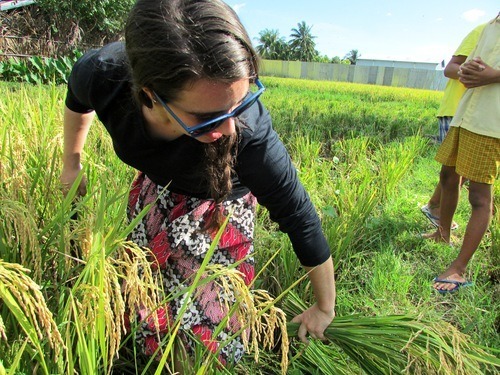 I had the opportunity to ask questions about rice of one of the workers who was busy harvesting, and even got to get into the paddy and try my hand at doing it myself. 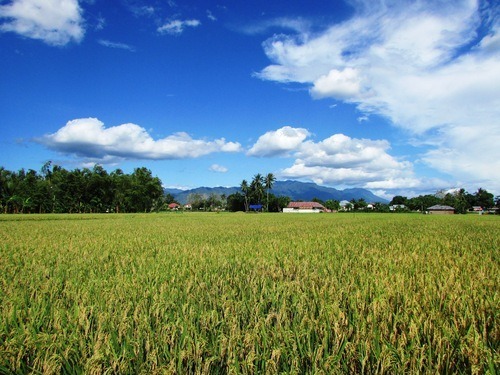 My route from one campus to the other takes me past many rice paddies, I have become more and more curious about this unfamiliar grain, and have been harboring the somewhat-secret wish to step into a rice paddy for quite some time now. 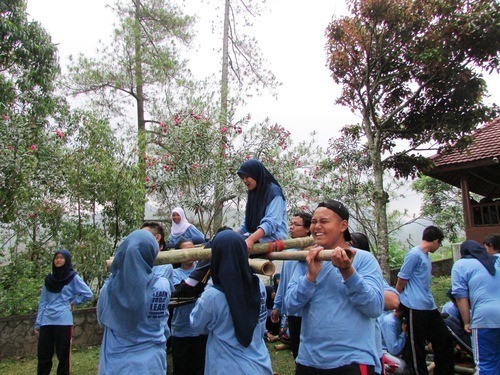 So though both the Indonesians present and my fellow ETA were calling me gila (crazy) as I stood ankle-deep in mud and cut down stalks of rice, I smiled and was senang (happy), for a dream was coming true. 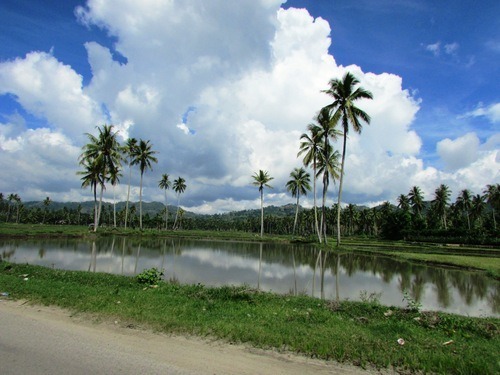 Gorontalo might be immediately surrounded by cows and rice, but it is also quite close to the ocean. 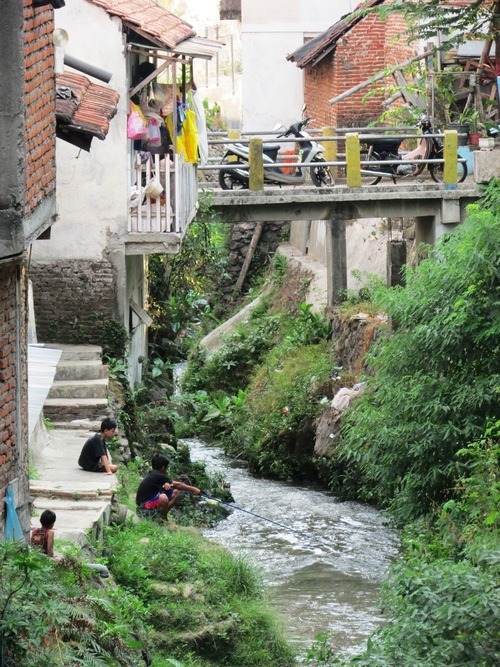 Malang is set in the mountains of East Java, and I am at least four hours from the nearest beach, so being in a place whose fishing industry is ever-present and the air tastes a bit like salt was a new part of my Indonesian experience. On my first night there, my friend wanted to take me to a beautiful beach she had been to, but we were unable to get there before dark. Instead, we pulled over at a small beach next to a desa (village), and enjoyed Indonesian waters the way they should be: with fishermen tossing their lines into the waves and anak-anak (children)—ranging from fully clothed to stark naked, but never in a proper bathing suit—leaping off of dilapidated foundations into the shallow waters near the shore. 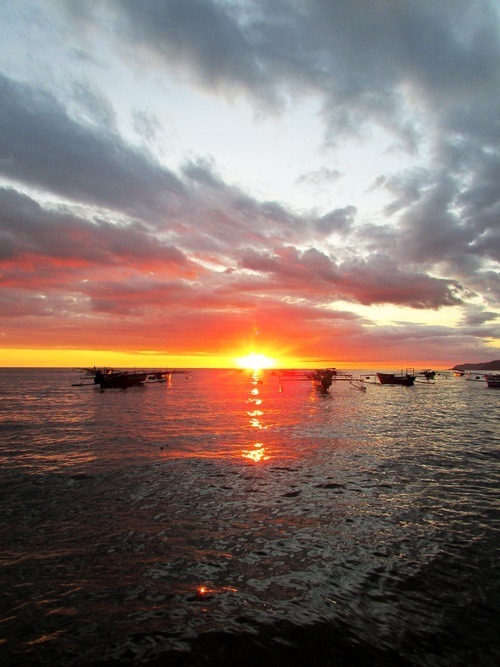 Watching the sun set into the ocean, as the sky veritably exploded into shades of red, pink, and orange, I was stunned, once again, by the beauty of the place in which I have found myself. It was my first proper ocean sunset since coming to Indonesia, and I could not have asked for a better one. The following day, we met up with another ETA who is placed in Gorontalo, and went on a quest for additional stunning shorelines. 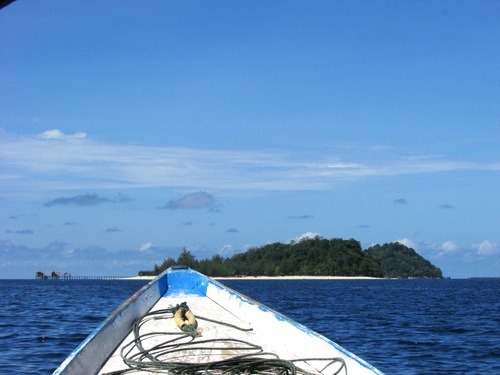 One of my friend’s teachers had told her about a pulau (island) off the northern coast of the Gorontalo province, Saronde, which was supposed to be gorgeous. Two hours on a motorbike through fields and jungle and one boat ride across the bluest water I have ever seen later, we reached a place so beautiful it evades even this English major’s description skills. Saronde is a small island whose only permanent residents are a husband and wife, their pet monkey, and a few wandering chickens and stray cats. There are a few cabins on the islands which can be rented out, but when we went no one had yet arrived for their weekend stays, and so we had the island almost entirely to ourselves. 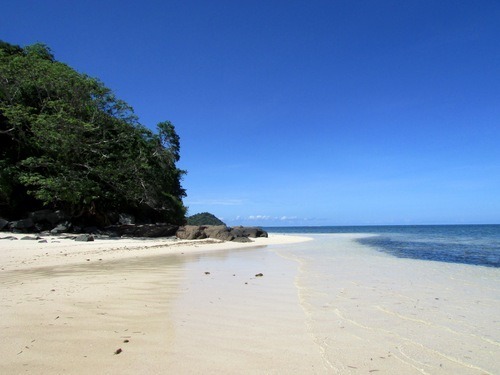 We soaked in the bright sunshine that made the white beach impossible dazzling and waded in the clear, warm waters, feeling all the while that we had somehow stumbled upon paradise. Although it is surrounded by the precise kind of mostly-unspoiled nature and humble farmland that my soul has been craving, Gorontalo itself is, indeed, a city, albeit one in which cows are found even in the town center. 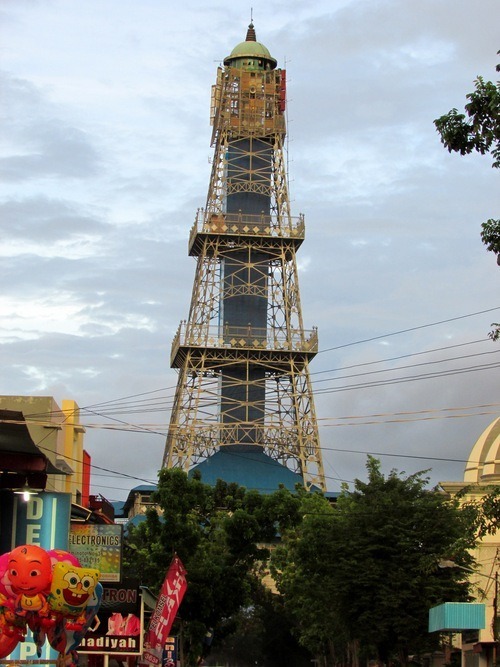 It is a small city, with a population less than one-fourth that of Malang, but one which has the feel of a swiftly developing metropolis which in some ways is seeking to leave its more rural roots behind, with its growing number of cafes and chain restaurants, and its Eiffel Tower replica towards the center of town. Much of my infatuation with Gorontalo stemmed from its small-town feel and its availability of quieter, emptier space—something I have struggled to find living on Java, Indonesia’s most densely-populated island—and so I find this rush towards perceived progress somewhat bittersweet, but I have not the expertise in development to claim that Gorontalo will become less as it strives for more; I am only sure it will continue to change with time, as all places do. All too soon, it was time to say goodbye. In barely forty-eight hours, I had explored new places, sampled new culinary delights, visited with friends, discovered that Bahasa Indonesia is almost a new language when you leave your island, and scratched an Indonesian cow behind the ears. As I sat on the back of my friend’s motorbike one last time, enjoying my last few glimpses of this beautiful place, I found myself snapping photographs not only with my camera but with my heart, determined to somehow save the enchanting experience I had had. Gorontalo might eventually transform into something almost unrecognizable, but I will forever carry my short time there with me, the little piece of perfect paradise I had not expected to find. 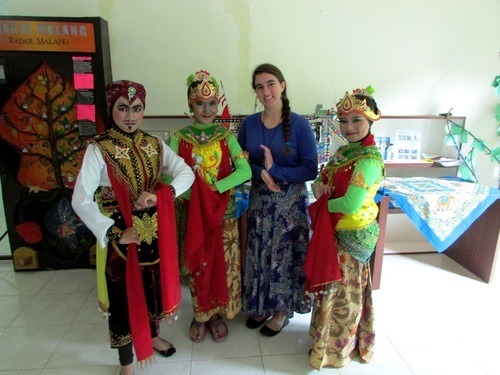 One of the reasons I applied for the ETA Fulbright program in Indonesia was to have the experience of living in a country where I did not speak the language, and therefore had to fumble my way through everyday interactions unable to articulate myself with the clarity to which I am accustomed. Part of this desire stems from my decision to pursue Applied Linguistics for my graduate degree and eventually acquire my TESOL (Teaching English to Speakers of Other Languages) certification. I wanted to have an experience similar to that of my students who are ELLs (English Language Learners), in order to help me best serve their needs. I knew that I could never truly put myself in their shoes, but thought that maybe I could at least come close. 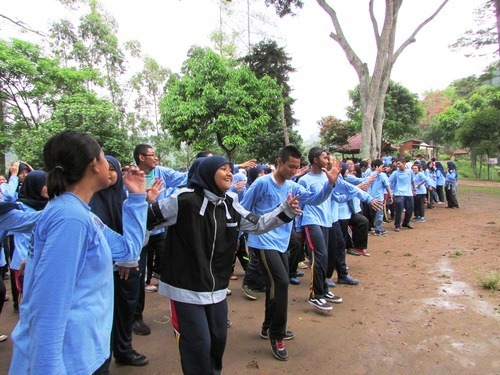 The language barrier has certainly been one of the greatest challenges of living in Indonesia. Even in my native tongue, I cannot fully describe the frustration of trying to articulate even the simplest ideas and not being understood. When I first arrived at my site, I had a solid grasp on greetings and could communicate any important needs I might have, but I could not hold any extended conversation with anyone who did not speak English without the kindness of a translator. I spent a lot of time trying to listen in on the conversations the other teachers were having, and fighting back tears when I realized I did not understand any of what was being said. I wanted to get to know the people who surrounded me, but could not ask them more than “Apa kabar?” (“How are you?”) I have never felt so isolated in a crowded room. Within a few weeks of arriving at my site, I was teaching alone in classes upwards of forty students, some of whose English level does not allow them to understand all directions in English. After explaining an activity with written and verbal instructions, I would ask students, “Jelas?” (“Clear?”), and at least half of them would shake their heads and reply, “No, Miss.” Usually, excessively pronounced hand gestures and drawing on the board would eventually result in their understanding, but it was hard not to feel like a failure as a teacher because I could not support my students in their native language. I admit, I almost gave up trying to learn Indonesian in the beginning. I have always struggled to learn languages: even after three years of studying Spanish at the college level, my speaking skills were still extremely weak. The ETA grant is only nine months, and in that time I hope to be able to communicate naturally with the people around me? It seemed an impossible task, and I was already overwhelmed by the multitude of other cultural differences I was surrounded by. I convinced myself that my response to people asking me if I knew Indonesian would forever be “Sedikit-sedikit” (a very little), and was fully prepared to throw up my hands in defeat. Sometimes it is easy for me to forget who I came here for, to selfishly only consider my own struggles. And that is when I give up. But I also have to remember how my actions affect those around me. That was all it took for my determination to be revitalized, and I began to be much stricter with myself about studying Indonesian every day. We had been given small textbooks at orientation from Wisma Bahasa, an Indonesian Language group based in Yogyakarta, and I had downloaded Stuart Robson and Julian Millie’s Instant Indonesian onto my Kindle before my arrival. I pulled them out from where they were hidden in my closet and began to belajar (study, or learn) Indonesian with a renewed vigor. I also enlisted the help of my sitemate, who was also an ETA last year; she not only knows much more Indonesian than me, but she is also an incredibly patient teacher. 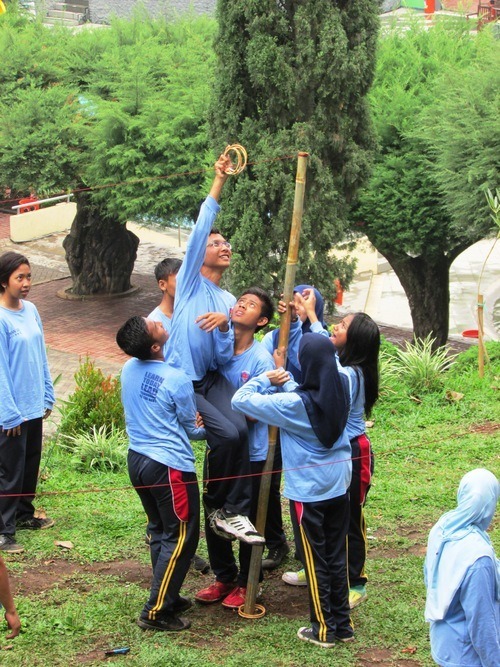 I also ceased to passively try to simply listen to the conversations around me, and began to ask questions of the teachers who speak both English and Indonesian. I began to say “Apa Bahasa Indonesia [insert English word here]?” with far more frequency than “Maaf, tidak mengerti” (Sorry, I don’t understand). I purchased a small buku tulis (notebook) and began writing down the words people taught me, as well as words from signs and documents that I wanted to look up later. It might have been the best purchase I have made since coming here. This tiny blue notebook goes everywhere with me: even if I have woken up late, my hair is a mess, and I have forgotten my cell phone, you had better believe that I have a pencil and my notebook in my bag. 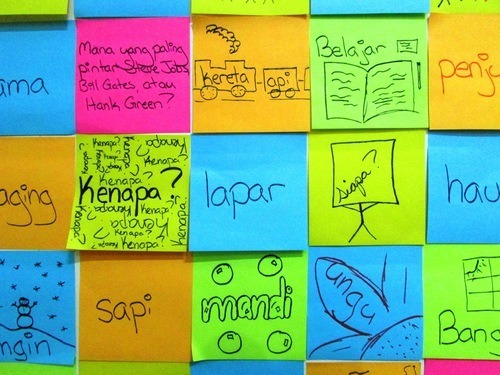 In an effort to further move my language learning away from my desk, I made another simple but life changing purchase: a stack of brightly-colored post-it notes. I assigned each warna (color) a different kind of word, and began writing down the words I was trying to learn. Now, my living room has become a learning space. 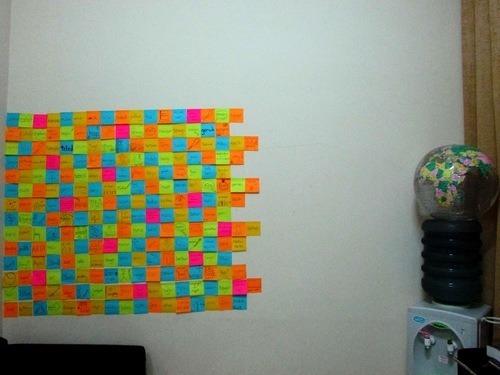 I put kata baru (new words) around the edge of the mirror near my door, and once I feel that I truly know a word, I move it to the “Word Wall” I have created on one of the walls in my living room. Though this wall was kecil (small) when I first began, it has since grown considerably, and I look forward to the day when it stretches all the way from one corner to the other, and to the day when it has nowhere to go but up. I still have trouble navigating most conversations, and I am constantly using incorrect structures and sometimes even incorrect words as I try to speak in Indonesian. Sometimes, my mistakes can be quite funny, such as when I tried to warn my one of my co-teachers, who was about to hit her head on a cabinet door, “Hati-hati, kelapa Anda!” This translates to “Careful, your coconut!” What I meant to say was “Hati-hati, kepala Anda!” (“Careful, your head!”) Needless to say, we still joke about coconut heads in the teachers’ room sometimes. But generally, my efforts have paid off. 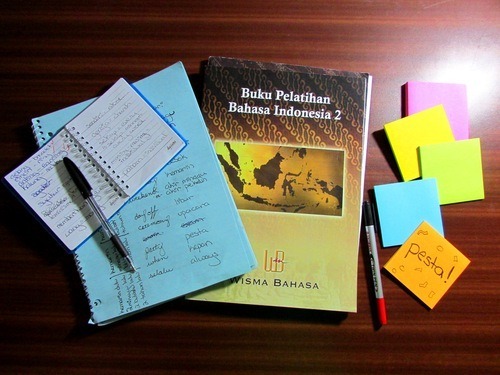 My Bahasa Indonesia has vastly improved over the past three months, and I am sure it will continue to do so as my grant continues. Though I still cannot articulate everything I want to say in my new language, I can recount simple stories from my weekend adventures and ask teachers for their opinions about workshops they attend. I can use a campur (mix) of Indonesian and English when giving directions or explaining a new grammatical concept in my classes, which not only helps my students’ comprehension and learning, it also encourages my students to try to use English in class, even if that English is as imperfect as my Indonesian. I have even begun to learn a few words and phrases in Bahasa Jawa (Javanese), the local language spoken by most of the teachers at my school. 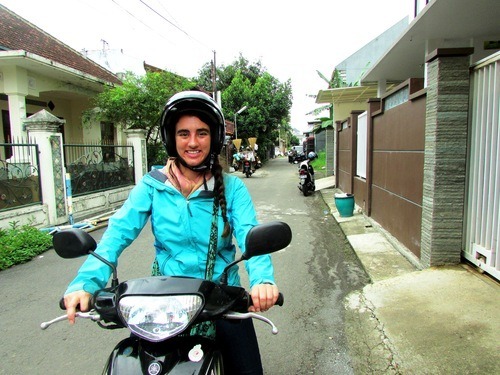 One day, as I was trying to talk to one of the drivers in Indonesian, he looked into the rearview mirror and said, in the little English he could muster, “Your Indonesian, not so bad.” It was the highest compliment anyone could have given me in that moment. I have a long way to go before my Indonesian is mantap (amazing), but I must semangat (keep spirit), as my students always remind me. Though for now I still respond to question of whether or not I can speak Indonesian with “sedikit” (a little), which is not much of an improvement from my previous response, I hope that by the time I leave I will be able to smile and say, “Bisa” (I can). Family. Turkey. Football. A problematic history. Pumpkin pie. Thanksgiving is almost impossible to understand simply and concisely, and I have found the task becomes even more difficult when I am living half a world away from any traditions I may associate with this holiday. Even when I was in England, I was able to have a small gathering with others in my program, which echoed the quiet day of family I usually have on Thanksgiving. 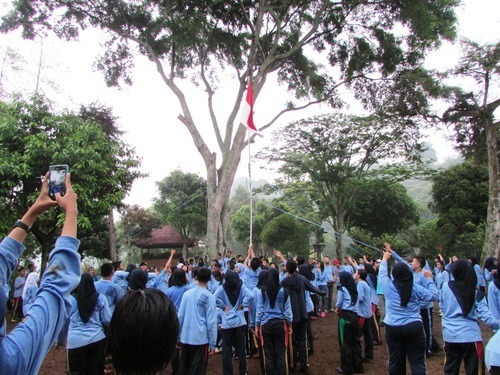 But this year Thanksgiving fell in the last week of classes at SMAN 10, and amidst the flurry of preparations for finals and last-minute grading, the last Thursday of November passed by with barely a nod to this American national holiday. That weekend, however, I was able to attend an event with the U.S. embassy in Jakarta, where there was turkey, potatoes, and pumpkin pie, amongst other western foods I had not realized I missed until they were again made available. More importantly, at least a third of my ETA cohort was able to attend the same event. 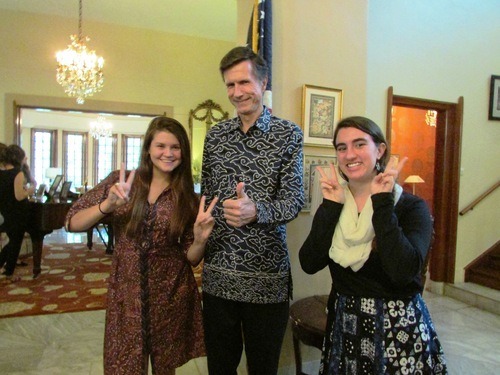 Being able to see them in person and talk without the frustrations of lagging Skype or dropped phone calls was the best part of the trip, though the opportunity to take silly pictures with the U.S. ambassador was also quite fun. Still, though traditional foods and time with friends and family are staple parts of Thanksgiving, in my family the most important part is the essence of the name itself, giving thanks. Though this Thanksgiving was very different from any I have had before, the season still inspired me to reflect upon my current situation and articulate what I am thankful for. I have been incredibly blessed throughout my life, and perhaps never so much as I am now. For the sake of concision, I have condensed my otherwise never-ending list to the top ten things that right now I find myself most thankful for. One: my family. My family has always been incredibly supportive of me, and I cannot possibly express how indebted I am to them for this. As a small-town farm-girl turned aspiring English teacher who has somehow found herself in Southeast Asia through a series of only partially well-thought followings of the heart, I know I have not made it simple for them, but they do it anyway. I am also fortunate that my family, both my immediate and extended, is composed of some pretty fantastic individuals. I have always been at least partially aware of this, but never has it been more apparent than here. When a student is furiously flipping through her dictionary because she desperately wants to tell me, “Your father is so… wise,” I simply must accept it as true. I have never been asked so many questions about my family as I have here, and in trying to articulate my favorite parts of them—their determination, their patience, their compassion, their humor—I have come to realize just how lucky I really am to have them in my life. Two: my friends. Going abroad can put a huge strain on friendships, but due entirely to the fabulous nature of friends from all parts of my life, thus far this has not been the case for me. My friends actively read my blog and often respond to aspects of it, and keep me updated about their own lives through e-mails, Facebook messages, and even the occasional piece of snail mail complete with postcards from their hometowns and holiday stickers. I confess that I am not always the best at responding promptly to the love they send me, due to a combination of inconsistent internet, a full and hectic schedule, and my own unwillingness to reply on days when an excess of frustration—at the challenges of teaching, at cultural differences, at my own perceived inabilities—renders me unable to fairly assess my current situation. And yet, they are completely understanding and continue to love me with the same uninhibited selflessness. Though I have certainly experienced a number of challenges since coming to Indonesia, I have, thus far, found my grant to have been easier than anticipated, in part because my friends from home, like my family, have been so supportive of what I am doing. I am also incredibly thankful for the friends I have made since coming to Indonesia. 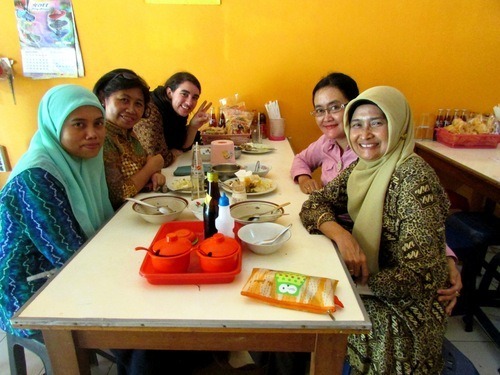 Teachers at my school, fellow ETAs, and members of the Malang community have all made me feel as though I have a place here, however difficult that may be to define at times. Though I am only a third of the way through my grant, I am already worried about leaving some of these fabulous people behind when I must return to the U.S. in May. Three: my health. Staying healthy in a foreign country is no easy task, and while I have certainly had my ups and downs as I try to contend with very different food and weather, thus far I have managed to avoid any major illnesses, for which I am extremely thankful. Teaching at two campuses within a culture I do not yet fully understand is exhausting enough without further filling my schedule with trips to the rumah sakit (hospital; literally “sick house”) for Typhoid or pneumonia. Four: my education. Without the educational background I was blessed to have had, I would not even have been able to become part of the Fulbright ETA program, and the lessons in empathy and critical thinking I have received from all aspects of my studies have certainly helped me to be the best cultural ambassador I can be. More specifically, I am especially thankful for my training in education; while I’m not sure anything could have prepared me for the challenges I would face in my everyday existence here, I know that I am struggling considerably less than other ETAs within the classroom, and much of this stems from my education courses and my years of experience volunteering in various classrooms and after-school programs. No matter how difficult the challenges I face here are on occasion, they are all worth it if I can feel that I am somehow aiding the students for which I am responsible, and this has been made possible by the particular course of study I was fortunate enough to pursue. Five: water. Indonesia is panas (hot), especially for this Northeasterner, who is far more accustomed to snow than this particular brand of sweltering. I would not be able to get through my day without the water bottle that is my constant companion wherever I go. I am also more aware of the privilege of water access now than I have ever been before, a topic I hope to cover in more detail in a later post. For now, I will merely say that every time I take a sip of clear, safe water, I do so knowing that I am amongst some of the most privileged people on the planet. Six: non-verbal communication. The language barrier here has been very much a part of my day-to-day existence. Never before has it been so necessary that I use hand gestures and facial expressions to communicate my meaning, both within and without the classroom. Smiles have always been one of my favorite methods of human communication, but here they have taken on a whole new significance, as some of the friendships I am developing began with smiles being the only language we shared. Seven: modern technology. There is no denying that if I had attempted this same program twenty, or even ten, years ago, the experience would have been very different. I live in an age in which I can use technology to keep in contact with family and friends, to plan lessons, and to augment my language learning. Yes, sometimes I do not have access to internet for days at a time, but even this inconsistent access is a blessing. Eight: the amazing undefinable mess that is young people. In many ways I could probably have included my students under the category of friends, because they have all gone so beyond being merely my students, and are often the people who are helping me to navigate my new life here. Though I am here to help them learn English, it is often they who teach me—language, life lessons, jokes—and it is my students who are my day to day motivation to keep going, and keep trying. But beyond the incredible awesomeness that is who they are as individuals is the essence of youth that permeates young people everywhere I go, and which I am persuaded somehow creates the openness, happiness, and caring that my students express. I will not pretend to understand what it is in human nature that allows this to occur; I will simply be thankful that it exists. Nine: to have been born where I was and to have lived where I have. Though I was aware of my inherent privilege of simply being American before coming to Indonesia, I am learning everyday new nuances to this privilege. (This, too, is a topic I hope to tackle in a later post.) But while I am—in many ways, most of them inherently problematic—thankful of all the advantages I have merely because I was born in a particular country, when I say that I am thankful for where I was born and lived, I mean more than that. Quite frankly, I find it especially hard to articulate what I am trying to say with this, but if I were to make a valiant attempt, it would go something like this: without the combination of various experiences I have had throughout my life, I would not be the person I am today, and I am discovering more and more just how capable the person I am is of navigating the various challenges life offers. I did not create myself. I was created by an amalgamation of factors that I am incapable of fully understanding, but am fully capable of being grateful for. Ten: the opportunity to be where I am now. 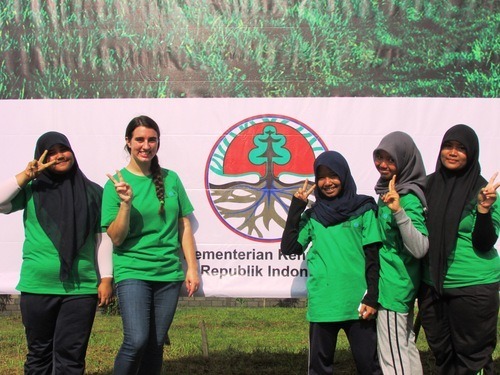 Just as my background helped to create the person I was when I arrived in Indonesia, the resolute but also slightly lost young woman who was not yet sure she had what it took to make it through the next nine months, my time here is shaping me into a new, and, I think, better, person. I do not believe that I will return to America unrecognizably different from the person I was when I left, but already I feel I am more patient, and closer to having the level of empathy I aspire to possess. I also recognize that simple being here is an incredible opportunity, and I cannot possibly express just how grateful I am to wake up every morning in a country I never would have dreamed of even being able to visit a little over a year ago. There are days when the challenges of being an ETA in Indonesia seem to be too much, and find myself staring at the calendar and resisting the urge to count how many days I have left until I can return home. But even on my toughest days, I have so much for which I must say terima kasih (thank you). Perhaps I should learn to do so more often.